After activating Messent CP, I headed off for my 3rd park activation of the day, the Reedy Creek Conservation Park. I continued south east along the Princes Highway, passing through Kingston and its famous ‘big crayfish’, and then further south east until I reached Claywells Road and then to the little settlement of Kangaroo Inn. Don’t blink, you will miss it. I found the southern end of the park which is on the northern side of Claywells Road, but it is pencil thin (only about 3 metres wide) and there is no access. So I then travelled north on Jorgensons Road which follows the creekline. Before I talk about the park, I can’t go passed mentioning some of the interesting history of the Kangaroo Inn area. 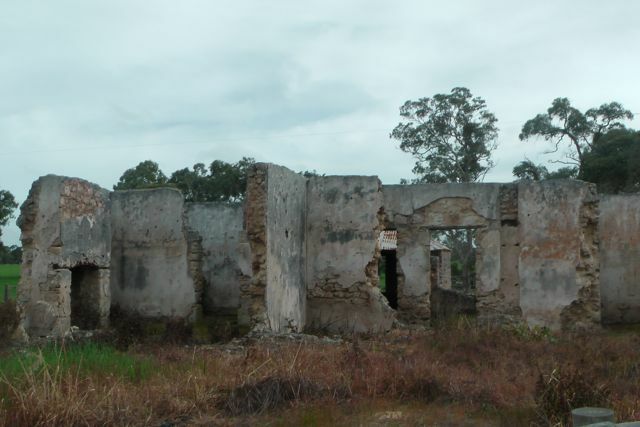 If you are going to activate Reedy CP, it is very worthwhile stopping off and having a look at the old hotel ruins, which are directly opposite the Kangaroo Inn Area School. In its heyday during the construction of the early drains in the area, the Inn serviced traffic from every direction, and was an important stopping point along the Mail Route and bullocky Route. The Inn, although unlicensed had a popular liquor trade, which was accompanied by its fair share of troubles (including an unsolved murder). The main wooden door was suspended from hinges, so that it could be lowered quickly to protect the occupants in the event of trouble. The pub closed when a new hotel opened at nearby Furner. 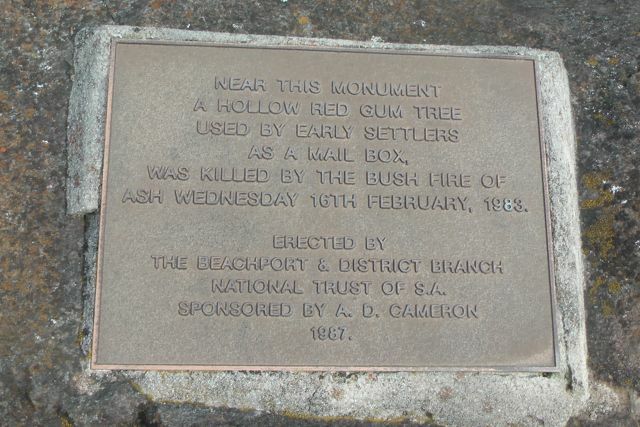 Also nearby is The Post Office Tree a reminder of the mail coach run to Mount Gambier. Mail was placed in a bag, and hung on a hook or branch ready for collection. 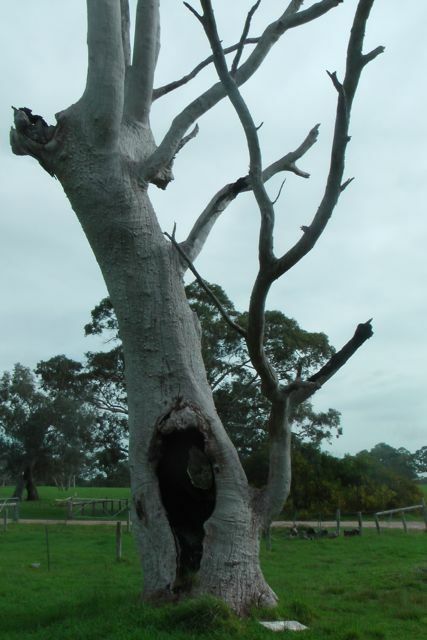 Sadly, the tree was burned by bushfires in 1983, but its charred remains still stand. Going back to the Kangaroo Inn….It was built in the 1840’s using stone quarried by pick and shovel from the stony ridges on the site of the present buildings. Once hewn into bricks with stone chippers, the stone was mortared together with a mixture of lime and sand. The ceiling consisted of lathe and plaster and the roof slats and iron. The bar door which was constructed of thick wood, was suspended on hinges at the top, so that it could be quickly lowered to protect the men inside the pub in the event of trouble outside. These old buildings which were built entirely by hand with local labour and none of our present-day machinery, were very strong and have in the main withstood the test of time. The history of the Inn is as varied as it is long. Originally it was a junction station built prior to the Victorian Gold Rush, and was used as a resting place for mail coach drivers and the general public travelling between Adelaide, Penola and Mt Gambier. Settlers from Guichen Bay and coaches run by Cobb & Co. would stop at the Kangaroo Inn to refresh, and rest both horses and people. Back then, it was a 30 mile journey which took about one entire day, before the next inn was reached. If travelling to Penola, this was Payne’s Inn; Mount Gambier, the Mt Burr Hotel; or Adelaide, the Telegraph Inn. Very few Chinese en route for the Victorian Goldfields ever stopped at these inns, as many were illegal immigrants, and frightened of being apprehended by government officials. Rather, they would build wells, situated well off the worn route. Some of these are still landmarks in the district today. Although it was unlicensed, Kangaroo Inn had a popular liquor trade, which in turn brought the district its fair share of troubles. Once, whilst the Reedy Creek Drain was being excavated by hand, a murder was committed. After a drunken brawl at the Inn between a Furner resident and a manual labourer working on the drain, the worker was found dead between Kangaroo and “Paynes” Inn. The case remained unsolved, and even today it is a matter of speculation as to who was the killer — the Furner resident or the local aborigines. In 1878, the proprietors of the Inn were Mr and Mrs Grant, who later settled in Furner. During this time railways were taking over the business of mail coaches, so the Inn gradually lost trade. It was finally closed in 1886, when the Kintore Hotel was opened at Furner by Mr A.H. Bellinger. Later, the Inn was converted to an overseers cottage for Gillap Station, then owned by Mr N.M. Donald (Senior). The remains of the shearing shed and old sheep dip can be found nearby. In the years after this, Kangaroo Inn was mostly deserted, only occasionally being used as a camp by woodcutters. Nowadays, it has been many years since used, and is in ruins. Kangaroo Inn is nearly as old as the state of South Australia itself, and has played a large role in the life and decisions of local generations, who toiled with the land to make the district flourish and reach the standard people have today. 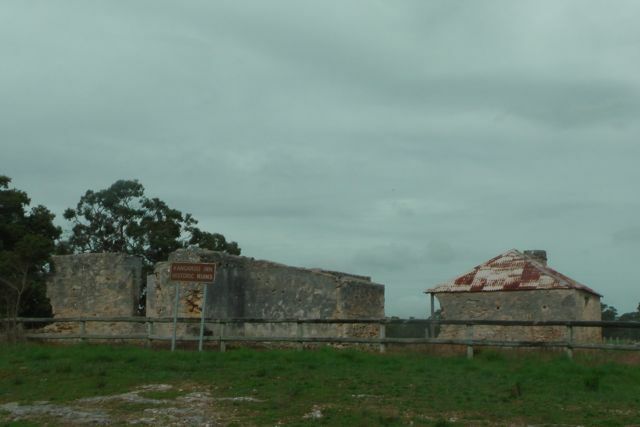 “The Inn” has been partially restored thanks to a South Australia Jubilee 150 Youth Grant. I was running a bit late due to activating the Messent CP (which was unplanned), so after having a quick look at the ruins, I headed north along Jorgensens Road, to access the park, which follows the Reedy Creek Wilmott Drain. 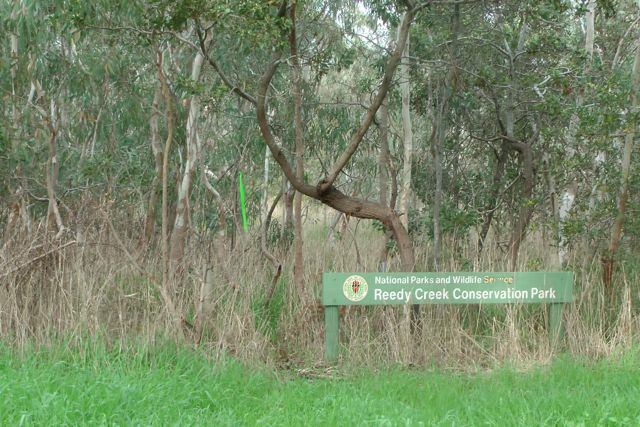 Reedy Creek Conservation Park was established in 1973, and covers an area of about 147 hectares. It was dedicated due to its fine stand of river red gums, however it was still used for grazing under lease until 1978. 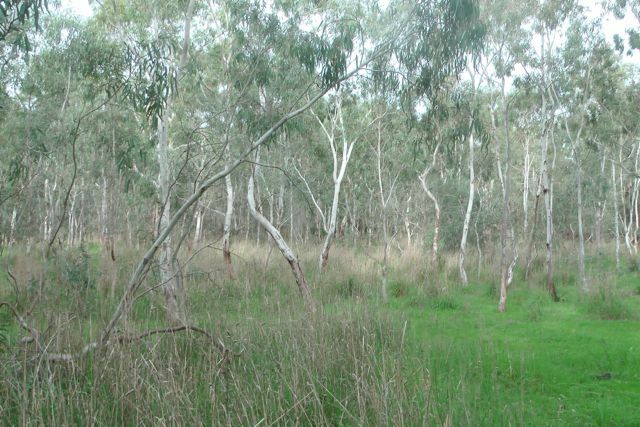 It consists of river red gum, open forest/woodland community, with brown stringy bark woodland along the western boundary. The southern half of the Park was burnt during the Ash Wednesday fires of 1983. There were quite a few wattle trees in the park which were out in flower, along with large areas of ferns growing under the forest canopy. 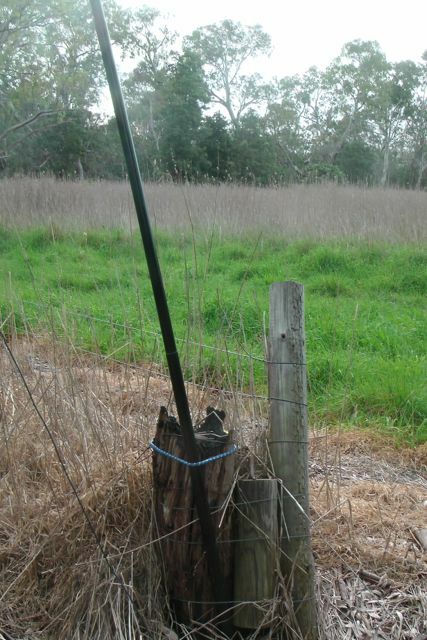 I set up my gear right alongside of the creek using an old wooden fence post to secure the squid pole with some octopus straps. There was a strategically placed large wooden post nearby which I placed the Yaesu FT-817nd on. 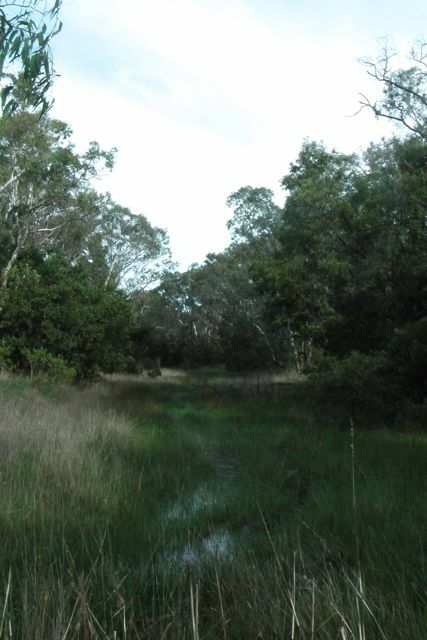 It was very wet and boggy underfoot, with plenty of water in the creek. My first contact in the park was a “Park to Park” QSO with Larry VK5LY who was portable at the Hogwash Bend Conservation Park. Larry and I exchanged 5/9 signal reports both ways. My next QSO was another “Park to Park” with John VK5BJE who was portable in the Fairview Conservation Park. John’s signal was a little weaker (5/6) with a 5/5 signal report in return for me. It was great to bag another 2 ‘Park to Park’ QSO’s. I was running late for my planned activation of Furner Conservation Park, so I packed up after only 30 minutes of operating. I ended up with 10 QSO’s on 40m SSB including a number of the usual Park ‘Hunters’ and a few new calls which was great. Even managed a good contact into VK2 with John, VK2FALL. Larry VK5LY/p; John VK5BJE/p; Col VK5HCF; Brian VK5FMID; Ron VK3AFW; Colin VK3UBY; John VK2FALL; Charles VK5FBAC; VK5FMMC; & Owen VK5HOS. Your blog is great: great detail and good reading.